It looks like we're getting a whole lot more Thrawn in the new Star Wars universe. Timothy Zahn, the author who created the fan-favorite blue villain in the Heir to the Empire trilogy of Star Wars novels in the 90s, returned to a galaxy far, far away this year with his new Thrawn novel. Apparently, Lucasfilm and publisher Del Rey were happy with the results, because at New York Comic Con a sequel novel, tentatively titled Thrawn: Alliances, was announced. What's more? Darth Vader is along for the ride this time. This is not a drill. For now, details are being kept under wraps, but the reveal was made during the Star Wars publishing panel at New York Comic Con by Timothy Zahn himself. Del Rey later confirmed the news on Twitter, via the official Star Wars Books account. They even made a point that Darth Vader is going to be joining up, or perhaps opposing, Grand Admiral Thrawn in this new book by using the hashtag #BlackandBlue. Two of the all-time great Star Wars villains are going to be part of the same story and that is no doubt an exciting prospect. "Thrawn is back. And he's bringing Vader with him. Coming summer 2018. #Thrawn2 #BlackandBlue"
Even though no plot details have been revealed just yet, it's quite likely that this new book will pick up where Thrawn left off. Timothy Zahn's first new novel told the origin story for Thrawn and we left off with him finally becoming a Grand Admiral who was headed off to very deep space for an unknown mission. By the sound of things, it looks like that mission will involve Darth Vader. Let's get ready to rumble, Star Wars fans. Thrawn is one of the biggest and most beloved villains in Star Wars history. This, despite the fact that he has never made an appearance in any of the movies. He only recently appeared on Star Wars Rebels season 3, which was met with a very positive response from fans. The character was introduced in the Heir to the Empire book trilogy in the early 90s. The three books surrounding the character are credited with reinvigorating fan interest in Star Wars at a time when no movies or any major Star Wars projects were being released. 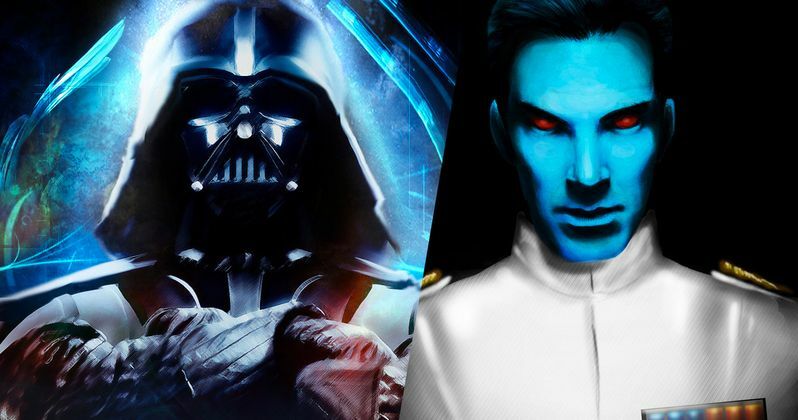 Even though that trilogy is no longer part of the Star Wars canon, Disney and Lucasfilm decided to bring Thrawn back to the canon, via Star Wars Rebels and Timothy Zahn's new books. That has proved to be a very popular decision. Maybe if Thrawn: Alliances does well, we can eventually see the brilliant, blue strategist make his way to a Star Wars movie? That is, if he makes it out of Star Wars Rebels season 4 alive. Be on the lookout for the new Thrawn novel next summer. You can check out the announcement tweet from Del Rey Twitter for yourself below.